130 pages | 30 B/W Illus. There is commonly-held belief that some people learn better than others because they are born that way. However, research indicates that many people who learn better are simply more strategic: they use effective strategies and techniques to improve their learning. Further, these strategies and techniques can be taught to students. Thus, understanding how we learn enriches our lives and the lives of others. Written by leading experts on learning, this book situates this topic within the broader context of educational psychology research and brings it to a wider audience. 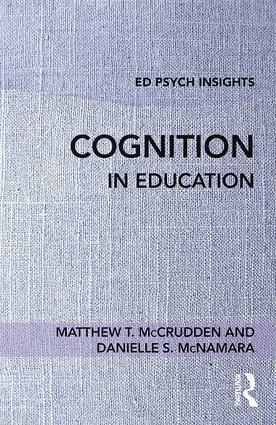 With chapters on how the mind works, evidence-based recommendations about how to enhance learning from both the perspective of students and teachers, and clear explanations of key learning concepts and ideas, this short volume is designed for any education course that includes learning in the curriculum. It is indispensable for pre- and in-service teachers and student researchers alike. "Cognition in Education is a useful primer for both students and teachers about learning—how it happens and how to improve it. The authors have struck a good balance, with just enough theory to understand and appreciate the practical learning and study strategies and tips described. The chapter on comprehension is particularly helpful and rich with ideas and examples. I especially appreciated the included glossary—all in all, the book is a great resource and an appropriate supplement for many courses." "Drs. McCrudden and McNamara have produced an excellent, clear, and concise description of human cognition. The book is eminently readable and explains sophisticated topics in an easy-to-understand style. It also includes an ample number of concrete, personalized examples that make the content engaging and even more understandable. The student perspective and teacher perspective sections, such as "Using Knowledge of Attention: Student Perspective," provide practical and real-world suggestions that can be immediately applied to learning and teaching. This is a fine piece of work, and I have cited it in several places in my own writing." How much time should pass between initial study and retrieval practice? Matthew T. McCrudden is an Associate Professor in the School of Education at Victoria University of Wellington, New Zealand. Danielle S. McNamara is a Professor in the Department of Psychology at Arizona State University, USA.